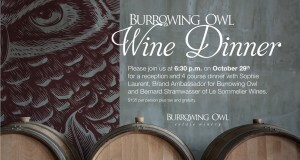 Enjoy a unique opportunity to experience 4 outstanding courses designed by George Restaurant’s renowned Executive Chef Lorenzo Loseto, expertly paired with 5 of Canada’s finest wines by B.C.’s Burrowing Owl Estate Winery. This Wine Dinner will be hosted by Burrowing Owl’s Brand Ambassador, Sophie Laurent, and well known Sommelier, Bernard Stramwasser. Sophie and Bernard will introduce each wine and explain the reasons behind the pairing, and share some fun and interactive stories of life at the vineyards at Burrowing Owl! Under the leadership of Executive Chef Lorenzo Loseto, George has become a top-rated and best restaurant for the city of Toronto’s fine dining scene. This evening is sure to be a wine and culinary experience not to be missed.